Talk about a late bloomer. 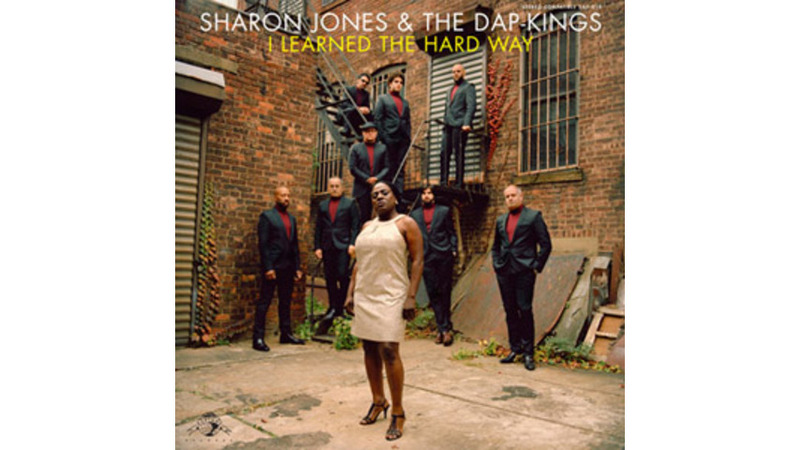 Sharon Jones was brimming with promise as a kid in church choirs in the 1960s, as she bounced back and forth between her birth city of Augusta, Ga. and her mother in Brooklyn. She also had a foot firmly planted in the world of secular music, spending countless hours imitating the songs and dances of fellow Augusta native James Brown. As a teen in 1970s New York, Jones flirted with fame, making many uncredited appearances as a backup singer on gospel, soul, blues and disco recordings. But when the neon-flash ’80s hit, her style was suddenly considered outdated. To support herself, she worked as a prison guard at Rikers Island (which surely came in handy later while shaking down sketchy promoters who dared hold out on her at the end of the night). In the late ’90s, then-fortysomething Jones made another go at a music career, releasing her first solo work, a series of 45-rpm vinyl singles for the retro-minded Desco label. But it wasn’t until 2002 that she dropped her first solo LP, Dap-Dippin’, or until 2007 that she released her first standard-worthy song, “100 Days, 100 Nights”; now, at age 53, she has released her first truly great album, I Learned the Hard Way. I’ve often heard the argument made—especially by wizened rock critics and music-industry vets—that all the young ’uns mesmerized by Jones and the Dap-Kings have been duped into believing that what would’ve been a dime-a-dozen soul revue back in the day is in the league of the all-time greats, thanks to the near-complete absence of authentic soul music in our digital age. I can see the merits of this idea: Jones’ first three records were solid, chronicling a measured shift from aggressive ’70s funk to melodic ’60s soul—but while the musicianship was strong, Jones’ vocals incinerating and bandleader Bosco Mann’s throwback production impressively authentic, the songs were mostly nondescript. They lacked hooks and choruses strong enough to put the leading lady into the company of the legends she and the Dap-Kings imitated. With Hard Way, though, this is no longer the case. The album’s majestic Philly-soul/Thom-Bell-indebted opener “The Game Gets Old” plays like a reality-check epilogue to The Delfonics’ 1970 I’m-really-leaving-you breakup anthem “Didn’t I (Blow Your Mind This Time).” It’s an instant classic, and Jones’ finest moment yet—an unusually successful attempt at capturing the perennially bruised heart of a struggling single. “So many times I’ve played the game of love but it always ends in vain,” Jones belts with the aching sincerity of someone who’s had her heart broken time and time again. “I’m back in the ring with my boxing gloves so I’m gonna feel some pain.” When it seems she’s about to break down, the shuffling hi-hat and funky guitar riffs spur her on; she draws strength from the swelling strings, and clings to the tiniest glimmer of hope as it chimes elusively off the bells. From there, I Learned the Hard Way doesn’t let up. There are half a dozen potential soul standards—“The Game Gets Old,” the title track, “Better Things to Do,” “Money,” “Window Shopping,” “Mama Don’t Like My Man”—and not a single weak link connecting them. The songs are both timeless and timely, as Jones tackles the recession (“Banks foldin’, President scratchin’ his head / ... Got to pay my bills, got to pay my rent / I’m hungry and tired but my money’s all spent”), domestic abuse (“Came home drunk in the middle of the night / Screaming and swingin’ with all of your might / But a child couldn’t put up a fight”) and independence (“I got better things to do than remember you”). Musically, it’s her most all-encompassing record, a synthesis of all the regional soul styles of the ’60 and ’70s: the sweltering rawness of Muscle Shoals, the canyon-deep grooves and melodic horn stacking of Memphis, the gorgeous slow-cooked string arrangements and high drama of Philadelphia, the irresistibly confectioned shoop-ee-doop backup vocals and candy-hook pop sensibilities of Chicago and Detroit. This time around, Jones and the Dap-Kings convincingly channel their many musical ancestors—Tina Turner, Otis Redding, Al Green, Isaac Hayes, The Staple Singers, Charles Wright, James Brown, The Temptations, The Delfonics, Marvin Gaye—like no one has in decades. Part of what makes this funky coup possible is the period-specific recording approach of producer/engineer Mann (aka Daptone Records co-founder Gabriel Roth), who has become a master of facilitating the suspension of disbelief necessary for listeners to embrace this antiquated sound. Mann recorded I Learned the Hard Way straight to a vintage Ampex eight-track, and the band almost exclusively uses instruments and gear made during the era they’re trying to emulate. This is the truly groundbreaking aspect of their music—their commitment to recreating a classic genre. Jones and the Dap-Kings make the kind of music that moves them, and their feverish passion is contagious. I caught one of their performances at Atlanta rock club The Earl a few years ago, and it was one of the wildest, sweatiest dance parties I’ve experienced. Everyone was packed in, grooving hard as they could in what little space they could find, grinning and letting loose. The Dap-Kings unleashed confetti explosions of funk and soul and Jones prowled the stage, ranting and raving like a possessed preacher. But instead of hellfire and brimstone, she was calling down pure, unfettered joy and throwing it into the crowd like bolts of lighting—ready to burn everyone’s souls clean down to ash, so they could start anew. And now, with Hard Way, she’s got more songs to match that level of performance. This is Jones and the Dap-Kings’ moment. The waters of the mainstream have already been tested with the backing band’s 2006 Amy Winehouse collaboration, and considering the tangible creative strides they’ve made with Jones on this new album, together they seem poised to finally burst through the dam that’s kept them secret from the masses these last eight years.